Earthjustice is defending a rule that saves up to 11,000 people from early deaths each year. 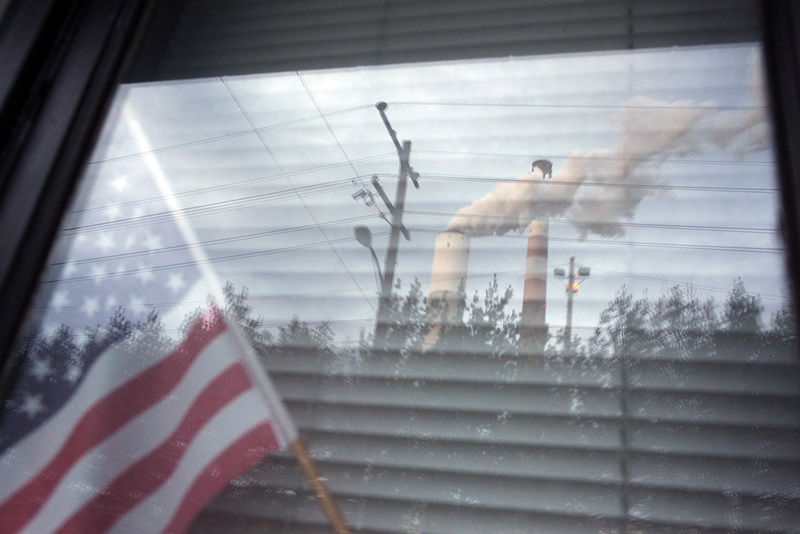 The Cheswick coal-fired power plant in Pennsylvania, reflected in the window of a nearby home, is among the hundreds of power plants likely covered by the Mercury & Air Toxics Standards. When coal is burned in the U.S., most of the mercury in the coal no longer spews into our air. This improvement is due to a 2011 federal rule that is now under attack by the Trump administration. The EPA’s acting administrator, Andrew Wheeler, is trying to undermine MATS and facilitate a lawsuit to eliminate it by his former industry clients. Wheeler has a long history as a lobbyist for fossil fuel producers, particularly Murray Energy, the main critic of MATS. Trump nominated Wheeler to succeed Scott Pruitt as the next head of the EPA, with his confirmation hearing scheduled for Jan. 16. With his attack on MATS, Wheeler has already shown his priorities: He’s willing to put more mercury in your body so that a few renegade coal companies can profit. 1. The Mercury and Air Toxics Standards force older, dirtier power plants to clean up their act. Coal-fired power plants are the worst of the worst industrial polluters. Until the MATS rule came on line, they accounted for half of the total man-made emissions of mercury in America and more than half of all arsenic, hydrochloric acid, hydrogen fluoride, and selenium emissions. They are also among the worst emitters of other toxics, including lead (think Flint, Michigan) and chromium (think Erin Brockovich). Initially established in late 2011 after decades of effort by Earthjustice and others, MATS became the first set of federal regulations to limit mercury and other air toxics emitted by power plants. It also was the first rule to require meaningful reductions of pollution from many older coal plants that had been allowed to dodge pollution control requirements for decades. 2. MATS drastically reduces toxic air pollution. Once MATS was enacted, the worst emitting power plants had to choose between shutting down or installing pollution control equipment such as baghouses and scrubbers. The results were stunning. Mercury emissions from power plants dropped by 81.7 percent from 2011 through 2017, according a recent analysis by the Center for American Progress. And, contrary to dire predictions by lobbyists for the power industry, power plants are continuing to operate and the lights remain on. 3. Trump’s EPA seeks to undermine MATS. However, Murray Energy, which claims to be the “largest underground coal mining company in America,” continued to challenge the rule in court. And now with Andrew Wheeler, Murray Energy’s former lobbyist, as acting administrator of Trump’s EPA, the agency wants to undermine the MATS rule and let more toxic pollution into the air. Wheeler is trying to undo the MATS rule in a particularly sneaky way. Rather than withdrawing the rule openly — a maneuver the courts have already nixed — Wheeler is proposing to declare that controlling coal-fired power plants’ toxic pollution was never “appropriate” in the first place. His hope, it appears, is that Murray Energy, his former client, will run to court with this declaration and have the MATS rule thrown out. Urge your representative to fight hard for your community's health — including blocking Wheeler’s proposed revision to the Mercury & Air Toxics Standards. 4. Cooking the Cost-Benefit Books. Under Wheeler, the EPA’s new argument is that the MATS rule is not “appropriate” because its costs outweigh its benefits. But that claim rests on some very dodgy accounting. First, the EPA considers only the benefits of pollution reduction that have been “monetized” — i.e., reduced to a monetary value. For example, the EPA doesn’t count the benefit of eliminating vast quantities of mercury from our air, water, and fish because those benefits have never been monetized. Likewise, the EPA assigns no value at all to eliminating tons of emissions of lead, arsenic, and chromium emitted by power plants. Instead, the EPA’s new analysis considers only the monetized value of the IQ points it anticipates will be lost by children who are exposed to mercury in freshwater fish. and 4,700 non-fatal heart attacks. All that adds up monetarily to $90 billion. The total cost of the rule is about $9 billion — dimes to dollars. 5. Fighting for clean air. Wheeler proposed his revision just before the federal government was shut down. The 60-day public comment period required by law will not begin until it reopens. But Earthjustice supporters can still take action right now by urging their representatives to block Wheeler’s proposed revision. In fact, much of the power plant industry supports MATS as it stands. Edison Electric Institute, the association that represents all U.S. investor-owned electric companies, and other utilities have written letters to the EPA saying just that. “They’ve already spent the money to comply, they don’t want a disruption by having the deregulation, and they don’t want the bad actors like Murray Energy to get a competitive advantage from this,” Pew says. If Wheeler’s proposal were to be finalized, it could establish dangerous precedent for future regulations. The new rule could create a higher threshold for future regulations by narrowing the range of benefits the agency can consider when devising new rules. This would make it nearly impossible for the EPA to justify new life-saving protections. Jim Pew is a staff attorney in the Washington, D.C., office. He joined Earthjustice in 1997. Since then, his work has included air toxics litigation to reduce toxins emitted from hazardous waste incinerators, cement kilns, coal-fired power plants, and more. Earthjustice's Washington, D.C., Office, established in 1978, defends and strengthens national standards for clean air and clean water, and safeguards public health in the mid-Atlantic region. The Mercury & Air Toxics Standards save lives. You can help defend these safeguards. Your new U.S. Representative started their first day on the job this month, and for the next two years, they work and speak for you. Tell your new legislators to fight hard for our communities’ health and our planet — including blocking Wheeler’s proposed revision. It’s time to introduce yourself to your new representative, and tell them whose community and whose values they represent. Did you find this resource useful? Please share this feature with your friends.